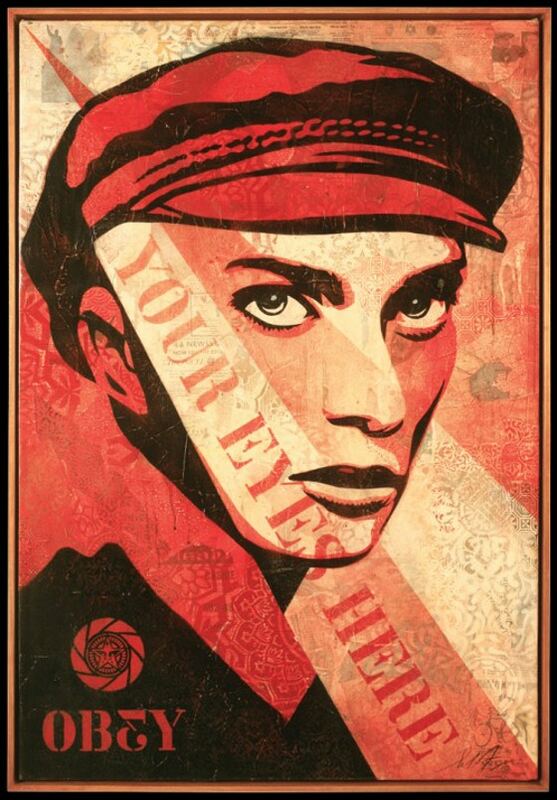 Home > Blog > Happy Birthday to Shepard Fairey! Happy Birthday to Shepard Fairey! Charleston born, street artist, graphic designer and illustrator, Shepard Fairey turns 44 today so here at Cass Art we're celebrating with a look back on some of his iconic works, unforgettable style and slick technique. Fairey first began dabbling in art in 1984 when he transferred his sketches onto t-shirts and skateboards, seemingly this year was a milestone for art and design as it just so happens to be the year that Cass Art's first store was launched! 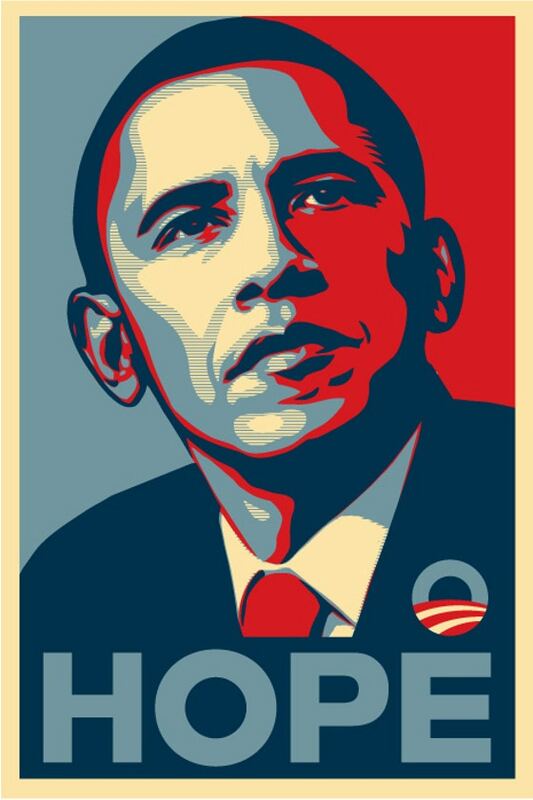 Fairey's work explores all kinds of political themes, from governmental policies to society's jaded tendencies, his Hope poster for Barack Obama's presidential campaign has been acclaimed worldwide. Speaking in a visual language that doesn't alienate the viewer, Fairey ensures that the accessible imagery invites people to work out the layers of meaning for themselves. Taking inspiration from the style of 1960s pop art and advertising, Fairey could well be hailed the modern master of spray paints, screen prints and collage. Just because Fairey's art is contemporary doesn't mean he skips any of the traditional techniques. He builds and primes his own canvases and creates his own papers with layers of rag paper, old newsprint and found papers, layering the surface tells of a history to the piece. There is a clear connection between the collage he creates in the studio and the art he pursues on the street, in both cases the rough and tactile surface is where the painting begins. 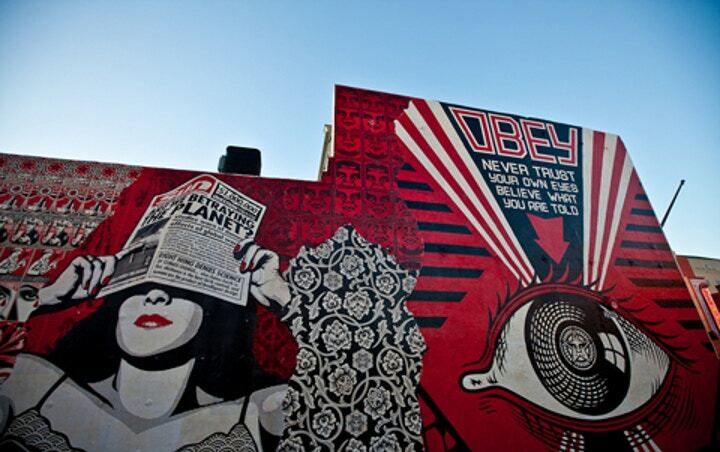 In 2010 Shepard Fairey began a series of commissioned murals around the US. A vast change from fly posters and tagging, the process behind large scale work proved to be very different. First coating the surface of the wall with a base colour and then once dry spray painting through pre cut stencils to achieve the background pattern. For the main figure a digitally printed sketch was lightly tacked to the wall and using a scalpel, certain areas and highlights were sliced away one by one in order to paint individually. For exterior works such as these, outdoor paint is necessary - like our weatherproof Montana spray paints. Back indoors, Shepard's screen prints are equally as arresting, sometimes using up to five different colours through the screen and then extra detail with stencilling and acrylic afterwards. His prints often feature groupings of lines to build up perspective and colour tones and feature dynamic, angular shapes which nods to his degree in illustration and interest in graphic design. Some of his prints are so large that it takes two people to drag the squeegee through the screen, which by any standards is pretty remarkable. When given the chance Fairey also uses relief printing, which is like lino printing, the artist inks up a pre designed plate, the raised areas will print onto the paper and the recessed areas will remain ink-free and blank. A beautiful embossing effect is created when using heavy metal plates, which literally adds an extra dimension to the piece. If you're feeling in the mood to see some real life Fairey art then the best bet is to keep up to date with Stolen Space Gallery on Brick Lane, where Shepard is a firm favourite and friend. Cass Art stocks plenty of tools and materials for you to create your own work in Shepard's style - from stencil books, acrylics, spray paints to an endless array of papers, not forgetting our lino printing and block printing sets, there's something for everyone. Head to our online store www.cassart.co.uk to stock up on your art supplies and follow us on Facebook and Twitter for the latest on materials, artists and exhibitions.